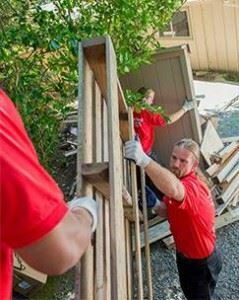 Most junk removal appointments are completed within 24 hours but same day appointments are also available depending upon when you call. Even if the crew swings by and is not of room in their truck, you won’t be charged for that session. You will only ever be charged a flat rate based upon how much space your junk will take up on the back of the truck. The crews working for Junk King Dayton pride themselves on how they treat a person’s property. They even handle the junk with care! They’re not in a rush at the expense of scratching up your floor a wall. If you can win over the pugs, then there is no higher honor! Get rid of your old junk the right way by hiring Junk King Dayton today. This entry was posted in Dayton Junk Removal and tagged Junk King, Junk removal, reviews, rubbish on September 25, 2017 by Junk King. Last updated September 25, 2017 .